^ 1.0 1.1 1.2 1.3 1.4 1.5 1.6 段洪坤. 《阿立祖信仰研究》. 臺南市政府文化局. 2013年12月. ISBN 978-986-03-9416-0. ^ 3.0 3.1 「平埔族」名詞淺說. 原住民族委員會. （原始内容存档于2016-06-11）. ^ 年長的平埔族婦女 Old Pepohoan Women, La-lung, Formosa. 高雄市立美術館. ^ 詹素娟. 熟番身份論─以日治時期的身份登錄為中心 (PDF). 中央研究院台灣史研究所. 2008. ^ The lastest figures of registration of Siraya people. Ethnic Affairs Commision of Tainan City Government. 2016-12-02 [2018-05-29]. ^ 呼應蔡英文平埔政策！花蓮富里首開「鄉定原民」先例，2年過去卻不滿百人登記是發生啥事呢？. Mata Taiwan. 2016-08-25 [2018-05-29]. ^ 部落大小聲節目 加蚋埔部落錄製平埔議題. TITV. 2017-11-10 [2018-05-29]. ^ 西拉雅平埔族註記、高市熟男266人.熟女207人. Kaohsiung City Government. 2016-09-13 [2018-05-29]. ^ 14.0 14.1 李, 壬癸. 珍惜台灣南島語言. 台灣本鋪：前衛出版. 2010: 159–182. ISBN 978-957-801-635-4. ^ 15.0 15.1 李, 壬癸. 新港文書研究. 中央研究院語言學研究所. 2010: 1–10. ISBN 978-986-02-3342-1. ^ 胡, 家瑜. 大武壠平埔的衣飾收藏與刺繡工藝. 高雄市立歷史博物館. 2014: 2–10. ISBN 978-986-04-1415-8. ^ Tsuchida Shigeru, Yamada Yukihiro, Moriguchi Tsunekazu. Linguistic Materials of the Formosan Sinicized Populations I: Siraya and Basai. Department of Linguistics, The University of Tokyo: University of Tokyo. 1991: 8, 29. ^ 劉益昌、顏廷伃. 臺灣史前史專論. 中央研究院、聯經出版公司. 2015: 258. ISBN 978-986-04-6324-8. ^ 日光小林. 陳菊，我們也是原住民！小林村大武壠歌舞文化節籲早日正名. Mata Taiwan. 2016-04-12 [2016-06-16]. ^ 凃順從. 《南瀛公廨誌》. 臺南縣文化局. 2002年1月. ISBN 957-01-0250-0. ^ Paul Jen-kuei, Li. 珍惜台灣南島語言. Taipei: Avanguard Publishing House. 2010: 139–208. ISBN 978-957-801-635-4. ^ 臺灣原住民平埔族群百年分類史系列地圖. hqq~青刊社地圖工作室. 2009-08-06 [2018-01-10]. ^ 林, 江義. 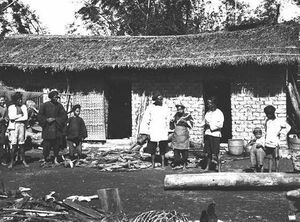 台東海岸加走灣馬卡道族的研究. Taipei: 國立政治大學民族研究所. 2004. ^ 劉秋雲. 道卡斯族語復振的困難與展望. 原住民族文獻. 2013年12月, (12期). ^ 佟振國. 巴宰語不死 83歲嬤自編辭典. 自由時報. 2016年11月6日 [2019年1月17日]. ^ 吳象元. 聯合國列為「語言已失傳」？台灣巴宰族回應：致力於復興傳統但有繁衍危機. 關鍵評論網. 2015年9月18日 [2019年1月17日]. ^ 原住民族青年陣線. 【認同我們的語言】#齊莉莎老師發言逐字稿 -原住民族青年陣線. 原住民族委員會. 2017年6月22日 [2019年1月17日]. ^ 林家鴻. 耆老全力搶救 經費需要支持. 台灣教會公報. ^ 中部平埔族群青年聯盟. 是不是平埔原住民該看DNA還是手臂那條線？3分鐘懶人包出爐，讓我們立刻尋根去！. Mata Taiwan. 2016年7月29日 [2017年10月1日]. ^ Chen, Shu-Juo, Ph.D. How Han are Taiwanese Han? Genetic inference of Plains Indigenous ancestry among Taiwanese Han and its implications for Taiwan identity, A Dissertation Submitted to the Department of Anthropological Sciences of Stanford University. Stanford University. 2009: 156 pages. ^ 陳叔倬; 段洪坤. 平埔血源與臺灣國族血統論 (PDF). 臺灣社會研究季刊. 2008, (第七十二期). Tsuchida, Shigeru. 1985. 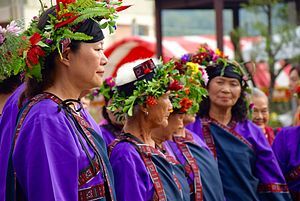 Kulon: Yet Another Austronesian Language in Taiwan? Bulletin of the Institute of Ethnology 60: 1-59.